Visualisation often helps immensely when trying to understand complex systems and interactions. 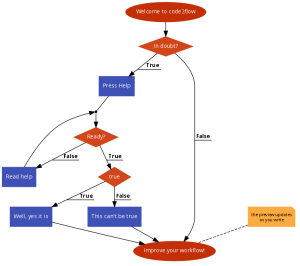 code2flow is a readily accessible, reactive tool that provides instant feedback to your input, which is how I think coding tools (and tools visualising code for that matter) should really work. I’m Damian from Code Charm, maker of code2flow. I just stumbled upon your post, thanks for covering our product. :) I’m very glad you find it useful. If you have any other remarks or ideas feel free to talk to me.